Suddi Raval & Simon Withenshaw called upon their extensive backgrounds in the music industry to form Classical Uproar in 2016. 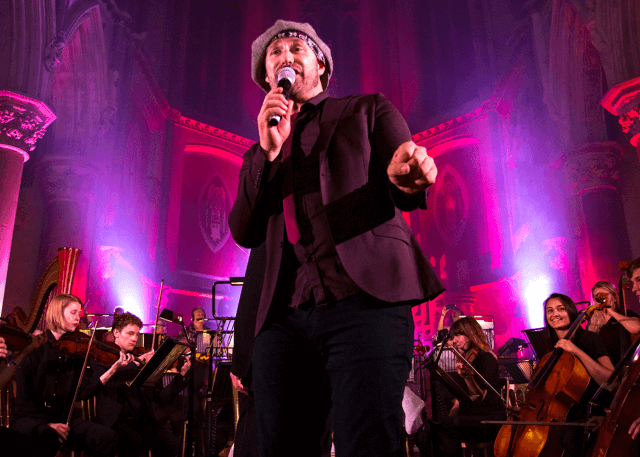 With a background in clubbing, DJing and promoting, they took the concept of playing dance classics with a live orchestra to new heights due to Simon Withenshaw’s experience with orchestral music. He has written orchestral scores for many of the biggest movie and video game franchises in existence and written orchestral arrangements for other international touring artists. Putting his experience into the Classical Uproar repertoire has pushed the bar for what can be achieved on the dance floor using an orchestra. Suddi Raval has brought his 3 decades of experience into the fold. He began his musical career with one of the biggest dance anthems to emerge out of the legendary Hacienda nightclub. He is currently promoting the third installment of the House Sound of Together (previous EP’s have included productions and remixes by Sasha, Urban Cookie collective and Phil Kelsey aka PKA). Suddi is a regular columnist for the dance music magazine Iconic Underground and is currently finishing a new book on the history of Acid House called A Brief History of Acid House. He regularly performs live both as Together and as a solo Acid House outfit in which he recently supported DJ Pierre and Phuture in Manchester. Classical Uproar work with an exciting team of vocalists who each have extensive experience in the live music circuit such as Alison Limerick, Tameka Jackson and Luke Neptune. Supported by our team of backing vocalists, they bring an incredible stage presence to our events. The team are completed by our highly enigmatic conductor, Simon Robertshaw, who brings his 14 years experience at the BBC Philharmonic.